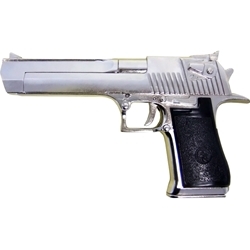 Desert Eagle® Pistol was conceived in 1979, and perfected in 1986, the Desert Eagle® Pistol has become a super star. Its combat prowess and distinctive looks have earned it staring roles in hundreds of film, TV shows and video games. Removable clip, working action.